I was thinking about how long we have been working on the boat today and it will be almost 2 years to the day when we finally launch. We picked up the plans on April 1st and we are planning to launch in late March so it will be close. We have been busy with a quick trip to Canada over the Thanksgiving holidays and then we had snow twice in the same week and now it's Christmas shopping and parties to get in the way of boat building. 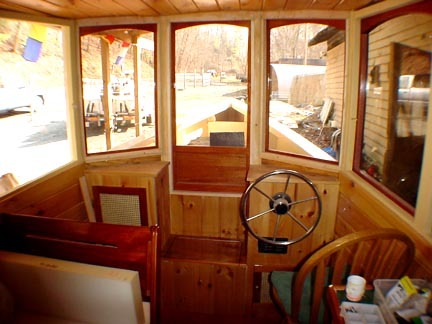 Last winter we built a plastic enclosure around the boat and were able to work in the warmth of the heater both in an out of the boat. This year we are able to close all the windows and doors and work in the boat but there is still the trip from the boat to the heated shop. It's been really cold but hopefully it is going to get out of the 30's this week and I can get busy making some doors for the cabinets. The Carolina's are usually warmer than this!! We did get a bit of good news though. It looks like the Highway Dept. has redrawn the right of way lines for the highway project that was scheduled to take our home and we may get to keep the house. Time will tell. Check back next week. The highway dept. has made an offer on the boat house property so I guess it will go in the not to distant future. I finally got a chance to get down there and do some work on the cabinetry during the 3 days of snow last weekend. I made the doors for the desk next to the bed and started getting the paneling up around the pantry. I had a piece of straight grained mahogany that I have been saving for the door on the pantry but had too many pencil marks and ended up cutting it too short....22" too short!! I decided that it was time to quit for that day and went home. It will be used for the doors under the fridge. I hope everyone has a Merry Christmas and Happy New Year. The new year should bring us a boat in the water about the end of March or so. Happy New Year!! We watched the new year come in with a bang over Pensacola Beach, Florida. It seems that Debbie and I have this bad habit of taking vacations instead of working on the boat but who cares. The weather this week end was fantastic. 70+ degrees the last two days and it felt great to get down and work on the boat. 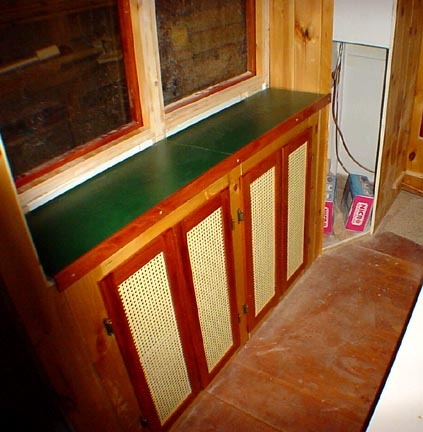 The new picture is of the front step/battery box and the other is of the desk area next to the bed. I got the formica on and the wire shelf in after I took the picture. I also put a door frame and paneling on the shower and fitted a step going out the back door. The door frames are varnished and ready to go on as soon as I get a lighter color canning to fit in the frames. We have some canning that was graciously donated by friends of ours but the color is too dark so we will try and find a light color to help brighten the interior. I think we are going to be suprised when we finally get the boat out of the shade and in full sun. It should be very bright inside with all those windows. 1/14/04 I went in search of a light color caning for the doors and after 5 or 6 phone calls to various furniture companies (this is the furniture capital of the world anyways) I spoke to Barbara Kincaid at D R Kincaid furniture and she told me she probably had what I needed to finish up. An hour later I had exactly the color I was looking for and she wouldn't take any money for it. There are still a lot of great people in the world. Just build a boat and you will see for yourself! I have been blessed with the gifts of time, support and materials from lots of people while building this boat. The frames now have the caning installed and I'll post a picture this weekend when I get them put on. I still need about 50-60 board feet of Mahogany to finish all the trim, door frames and handrails but the company in Hickory that I bought my last batch from will only sell me a minimum order of 200 feet. I can get it in 1 3/4" or 1" thick (a board foot is 12"x12"x1" thick) for about $4.74 a foot plus tax. If anyone would like to buy 125-150 feet, let me know and I'll get it ordered. I get great looking Honduran Mahogany from them but just don't need all 200 feet right now. 1/18/04 I found the mahogany I was looking for finally. I need to take a minute and promote The Hardwood Company of North Carolina in Gibsonville,NC. Debbie and I rode over to their warehouse yesterday to see what they had in the way of mahogany and were suprised to find that they had great looking mahogany in any thickness and length(all the way to 12/4), as well as any other hardwood you could want. The guy that helped us was super nice and they even ship as little as 20 board feet. Check out their page here www.hardwoodstore.com I started cutting the frames for the head, shower and pantry doors. 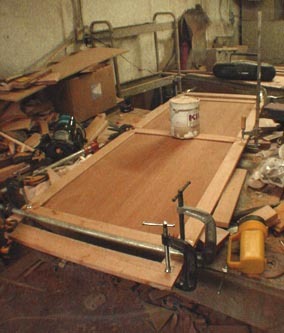 The picture of the door being glued up also shows the organized chaos in my shop. 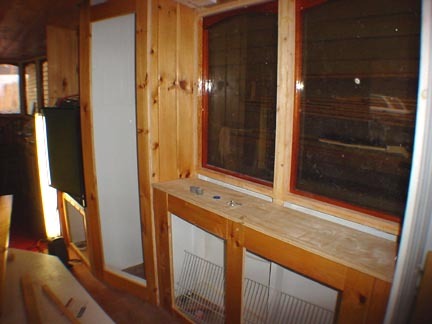 I'm using 1/4" mahogany plywood in the shower and head doors with caned vents at the top and bottom for ventilation. 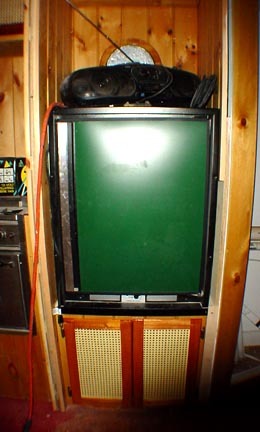 The other picture shows the doors under the fridge and desk. I put up a picture of the sled I made for the tablesaw. It's an old piece of 3/4" plywood with runners on the bottom that fit the slots in the saw table. I use this setup for all the lap joints on the door frames. It allows me to keep the piece I'm sawing steady while moving the whole sled to make the cut. The bed of the saw is kind of small and the sled is bigger than the table and makes a larger working surface. 1/25/04 I was hoping to have pictures of the doors that I've been working on installed but mother nature had other ideas. The expected winter mix is turning out to be 6-8 inches and it's still snowing. Oh well... I did get the first coat of varnish on three of them but the snow will keep us away from the shop for a day or two. 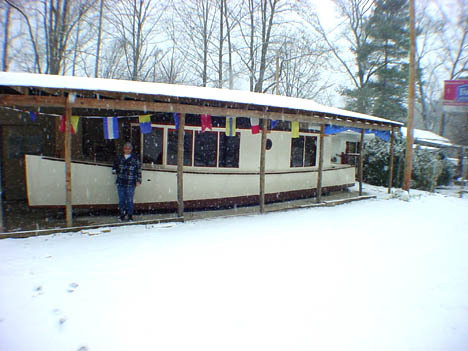 Ok, so you want to know how I got the shot of the boat in the snow, right? We managed to go down early this morning and do a little work in the shop and take a picture but decided to head back to the house before the roads got really bad. The highway dept. must be running out of money because they are only plowing sporadically and the roads are a mess. Saw several tour buses with skiers going really slow and lots of cars in the ditches. I'll be content to sit here and look at other peoples boat pages I guess. Door for the head getting glued up. Lots of clamps needed. 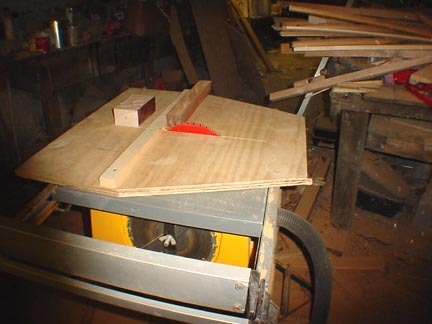 This is the sled jig I use for cutting lap joints in door frames. Snow and boat building do not go well together!